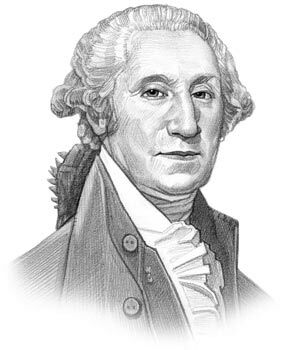 George Washington was the first President of the United States and served in office from April 30, 1789 to March 4, 1797. The Bill of Rights was adopted just before he became president. This section contains details of he first 10 Amendments to the US Constitution are called the 'Bill of Rights' which guarantee the basic liberties to Americans. Articles on the Bill of Rights contain a simplified summary of Amendments 1 - 10 of the Constitution, the original full text of the Bill of Rights amendments, the cause or reason for their addition to the United States Constitution and a line by line explanation of each of the Bill of Rights amendments together with a simplified meaning and Summary. The links provide access to interesting, simplified articles that provide the text and content of each of the first ten amendments together with a very short, simplified summary of what the amendments actually mean. The simplified summary of each of the amendments 1 - 10 that constitutes the Bill of Rights give easy, simple information for kids, schools and homework. Short, Simple Summary with full Text of the 1st amendment of the Bill of Rights detailing Freedom of Religion, the Freedom of the Press and Freedom of Expression in the Constitution. Short, Simple Summary with full Text of the 2nd amendment of the Bill of Rights detailing the right to keep a weapon and use it to protect themselves. Short, Simple Summary with full Text of the 3rdamendment of the Bill of Rights relating to the early Quartering Act with a summary stating that soldiers cannot take, or live, in a person's house without permission of the owner. Short, Simple Summary with full Text of the 4th amendment of the Bill of Rights stating that a person or their property cannot be searched unless there is "probable cause" that a crime has been committed. Short, Simple Summary with full Text of the 5th amendment of the Bill of Rights detailing the need for 'due process of the law' before punishing a person and the right to a trial by jury as detailed in the Constitution. Short, Simple Summary with full Text of the 9th amendment of the Bill of Rights that states that the Constitution of America does not include all of the rights of the people and the states. Find out about the English Bill of Rights and the impact of the War of Independence and the State Constitutions. Discover Why it was created and amendments added, when and where it was written and when it was ratified. A simple overview of Amendments1 - 10 for kids all in one place. The original text and a simple summary explaining the words and the meaning. History of the First 10 Amendments, the Objections to the Constitution, the Opponents of the Constitution, the "Father of the Constitution" and summaries of the first 10 amendments. The 1st amendment to the Constitution addresses the right to freedom of religion, choice of worship, freedom of speech, the right to be informed by the freedom of the press, to be able to meet in groups and the right to request the government to make good any injustices. The 2nd amendment of the additions to the original Constitution states that people have the right to keep a weapon and to use it to protect themselves. The 3rd amendment to the Constitution refers to the hated Quartering Acts imposed by the British during the War of Independence and states that soldiers cannot live in a person's house without the permission of the house owner. The 4th amendment to the Constitution refers to the Search Warrants and states that the federal government cannot arrest a person, or search their premises, without "probable cause" that a felony has been committed. The 5th amendment to the Constitution states that the government must follow the due process of the law before inflicting punishment and that Americans had the right to trial by jury and could not face trial twice for the same crime (the Double Jeopardy Clause). It also affords the right to citizens to remain silent. The 6th amendment to the Constitution ensures the right to be told what crimes they are accused of and to be given a quick and fair trial by a jury. The 7th amendment to the Constitution relates to the rights of citizens being sued and states people have the right to a trial by jury for civil cases. The 8th amendment to the Constitution states that the government cannot demand excessive bail, fines, or excessive punishments. The 9th amendment states that the Constitution does not include all of the rights of the states and its citizens. It also reassures American citizens that such rights could not be removed and that the Constitution would limit the powers of government. The article on the Bill of Rights and the amendments to the Constitution provides the text and a summary of one of the most important documents in the history of America, the Constitution. The following video will give you important facts and dates about the political events experienced by all of the Presidents of America.